You're facing an uphill climb of 4420 vertical meters on this hike. This is quite much. You should be fit to do this track. This makes the hike one of the 3 hikes with the most ascent in Italy. The high point of the hike is located at an elevation of 7267 ft. 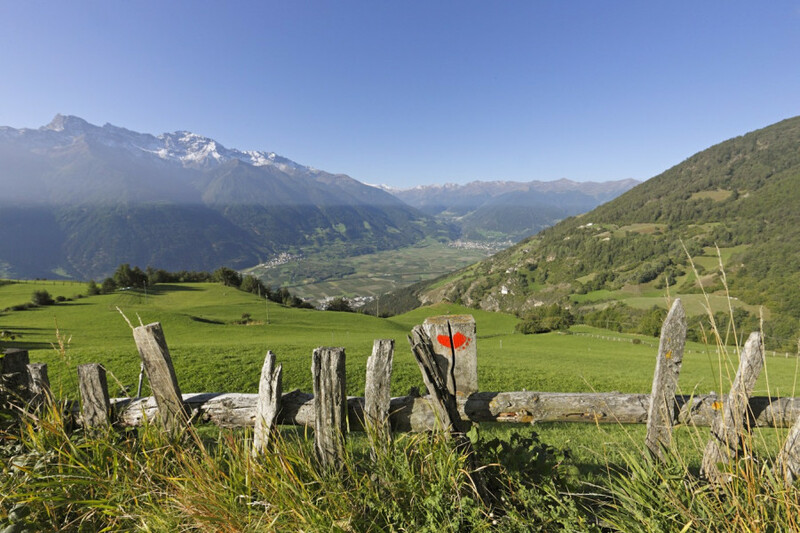 The Venosta Valley High Mountain Trail is among the 3 best rated Hikes in Italy. With an overall length of 67 miles the hike is currently the longest hike in Italy available on TouriSpo. Sturdy hiking boots are recommended on this track. There are places to buy beverages and food along the track. However it’s always recommended to bring enough water and food along with you. The 108 km Venosta Valley High Mountain Trail is a real treat for walking fans. This challenging multi-day tour leads from Staben in the lower Venosta Valley along the sunny slopes of the mountains up to the source of the Etsch on the Reschenpass saddle at the head of the valley. 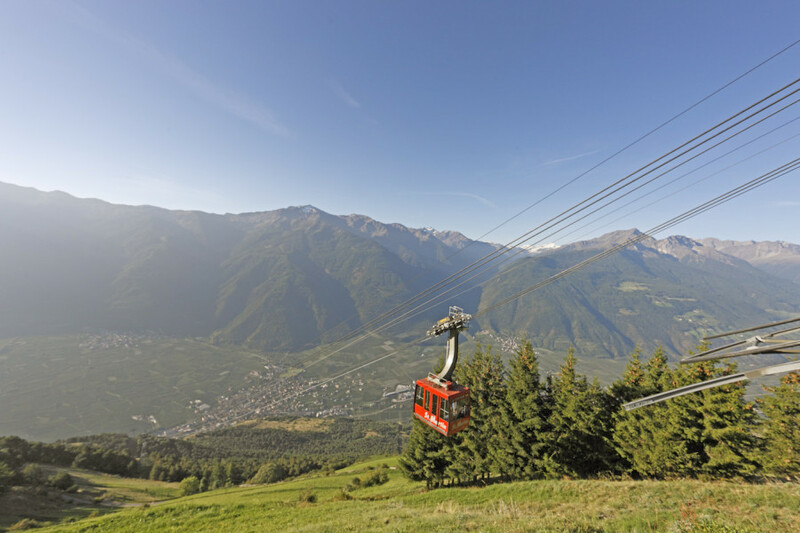 Along the route, you can marvel at the biodiversity of the region and enjoy some stunning panoramic views, including vistas of the region’s highest mountain, the 3,905-metre Ortler beyond the fertile valley below. Some of the route leads along mountain paths hugging water irrigation canals (known as Waalwege), along age-old connecting paths between mountain farms as well as newly constructed footpaths. The Venosta Valley High Mountain Trail is a challenging hike. As a result, a good level of fitness, surefootedness and mountain experience is essential. The best time to tackle the route is between April and October, though mid-summer temperatures are often very hot here. The entire route is marked with a red logo, and hikers can also use the option of having their luggage transported from stage to stage. On the first stage, you start in the village of Staben and take path number 1b up to the Schnalser Waalweg. You then follow route no. 3 and head along the high level path on Trumsberg. En route, you can enjoy incredible views of the Venosta basin and the snowy glacier in Martelltal. At the Jausenstation Niedermoarhof, you can treat yourself to a well-earned rest before continuing on path number 2 to St. Martin im Kofel, your destination for the day. The tough second leg of the Venosta Valley High Mountain Trail is enough to challenge even the most experienced hikers. Follow path no. 14 to the hamlets of Egg and Forra, before continuing on past the ruins of several abandoned mountain farms. On the way you can take a slight detour and a break in the Fisolguthof on Schlandersberg (route no. 7). Then continue on towards Rimpfhöfe until you reach Tanas, where this leg ends at Gasthof Paflur. Alternative: Alternatively, you can walk from St. Martin im Kofel/Latsch to Kortsch/Schlanders (descent into the valley). The roughly 12 km route via Egg, the Ilswaal and Kortsch takes around five hours. You start the day at Gasthof Paflur near Tanas and take the Venosta Valley High Mountain Trail towards Oberfrinig and Unterfrinig. You will subsequently arrive at the Gschneierhöfen and then the Jausenstation Ortlerblick, which perches above Schluderns. Along this section of the route, walkers are treated to several outstanding views of the Ortler massif. One worthwhile detour takes route 21 to Schluderns and the Churburg castle. At Geschneierhöfen, please take the Geschneierhöfen Waalweg and head into the cool pine forest which extends into Matschertal. From Matsch you then reach the head of the valley and Glieshöfen. You can spend the night here. You start the fourth leg at Glieshöfen at an altitude of 1,800 m and initially climb up to the Matscher Alm at 2045 m above sea level. This is the highest point in the Venosta Valley High Mountain Trail. You then follow the south-east facing slopes of the Matschertal and continue on until you reach Muntetschinig/Mals. From there, route no. 18 winds its way to the Weiler Muntetschinig, which nestles above Tartsch. You can grab something to eat here and spend the night. Alternative: There is also the option of heading from Glieshöfen in Matsch/Mals to Planeil/Mals. Seven hours are required for the roughly 21 kilometre route. The trail leads from Glieshöfen to Planeil via the Matscher Alm, Neue Gonda Alm and Spitzige Lun. The fifth leg is a little lighter. You walk from Muntetschinig to Malettes, which sits above Mals and offers up sumptuous views of the Ortler and Weißkugel groups. Follow the paved road and forestry road no. 15 to reach the unspoilt village of Planeil. The last leg of the Venosta Valley High Mountain Trail heads from Planeil through the idyllic mountain villages of Ulten, Alsack and Plawenn in the beautiful Upper Venosta Valley. Subsequently you pass through St. Valentin to the lake promenade on Reschensee. Follow this path up to the well-known tower in the lake, which still bears witness to the flooding of the village of Graun in 1950. It’s not far from here to the conclusion of the Venosta Valley High Mountain Trail – the source of the Etsch. Alternative: On the sixth leg, you can head from Planeil/Mals to St. Valentin and then via the Haider Alm high-level route to Schöneben. This route leads from Planeil to the source of the Etsch through Ulten, Alsack, Plawenn, Haider Alm and Schöneben, and totals 21.4 kilometres in length. You should plan around seven hours’ walking time for this section. The route passes plenty of mountain huts and inns, offering food and drink and the chance to take a break. However, ensure you take plenty of food with you on each leg, as the route is long and challenging in places. Quite apart from the obvious natural highlights, the tour also takes in several cultural and culinary sights, such as Churburg castle. 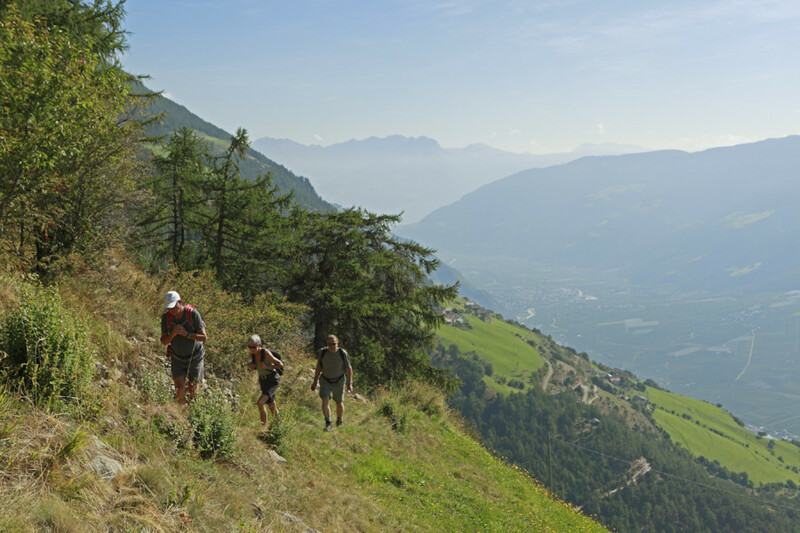 In addition to the alternatives for stages 2, 4 and 6, you also have the option of walking the Venosta Valley High Mountain Trail in the opposite direction – from the source of the Etsch to Staben. It’s also possible to only walk individual sections of the Venosta Valley High Mountain Trail, and these are easily accessible via the connecting trails from the villages in the valley. 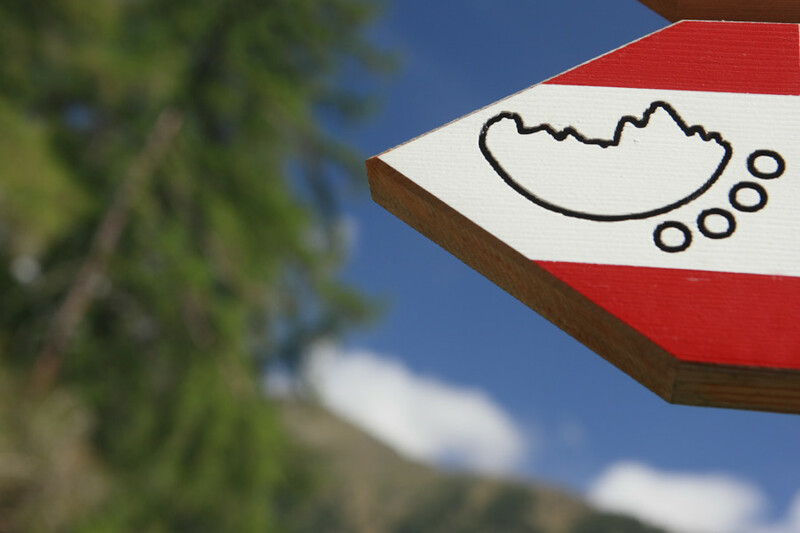 By car: Driving from Merano, Staben is accessible via the SS38. The starting point of the trail is just beyond Naturns, and you can park your car in the free car park in the centre of the village (close to the train station). By rail: The Vinschger Bahn rail service carries passengers from Merano and Mals to Staben as well as several other access points along the route. You could also take a taxi or use the Wanderbus hikers’ bus service.